Recycle 4 Kids is a group I found online which lets you print a prepaid shipping label to recycle your empty inkjet and toner cartridges. They pay fees for each cartridge you send which can either be applied as a donation to various children's charities or as a fund raiser for your own group (such as a school). EcoPhones another fund-raising model which accepts cell phones, ink jet cartridges and DVDs. Print Country provides mailers for the return and recycling of ink jet cartridges (and they also sell new cartridges). Second Rotation will purchase your consumer lifestyle goods (such as consumer electronics, including digital cameras, camcorders, cell phones, GPS systems and MP3 players) and then resell them on ebay. The website will help you determine the value of your gear. And finally, another option I found here locally (in my Whole Foods store, of course) is Green Citizen. You don't get paid for your items, but you don't have to mess with shipping or saving up a certain quantity. 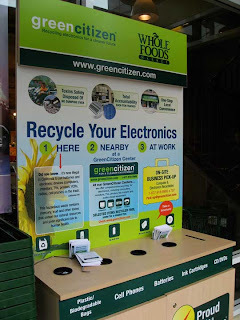 Their in-store kiosks accept plastic bags, cell phones, batteries, ink cartridges, and CD/DVDs. You can even bring larger electronics to one their drop-off centers or have them pick up from your small business. Of course, when it comes to large electronics you can always check Earth 911 for recycling options in your area. And if by chance I find out that my kids' schools are hosting a fund raising program for cartridges, such as mentioned above, I'll have you send all your old ones to me! Just kidding. When you buy Staples cartridges, they supply an envelope to send back your old printer cartridge for recycling -- no matter what make it is. I also saw something at Walgreen's recently about bringing in your old cartridges and they will refill them somehow...haven't tried it, though! Great idea.I find out that my kids' schools are hosting a fund raising program for cartridges, such as mentioned above, I'll have you send all your old ones to me! Just kidding. Great Deals on Printer Ink Cartridges - Up to 65% Off HP, Espon, Lexmark, Dell, Canon and more.